In the elevator industry, breakdowns are bad for business. So when Thyssenkrupp North America needed help predicting when to service its lifts, it turned to Microsoft, a partnership that illustrates how Microsoft CEO, Satya Nadella, has leveraged the cloud to grow its own business. A 2014 meeting between the leadership of the North American operations of Germany's Thyssenkrupp AG and newly installed Microsoft CEO Nadella led to MAX, a predictive maintenance service built on Azure, Microsoft's cloud-computing platform, which has since been used to connect the elevators of 41,000 Thyssenkrupp customers to the cloud. Before that meeting, the company's relationship with Microsoft consisted largely of renewing its licence for Windows software. Since then, Thyssenkrupp North America's spending with Microsoft has more than doubled, CEO Patrick Bass told Reuters. Leveraging the cloud to enlarge its relationship with customers like Thyssenkrupp has been a key to Nadella's strategy, and it has paid off: Microsoft shares are up 180 per cent since Nadella took over, and its market cap edged above US$800 billion for the first time earlier this month. When it reports earnings on Thursday, the tech giant is once again expected to post banner results, fuelled by its fast-growing Office 365 productivity suite subscription service and the Azure cloud computing business. Its work with Thyssenkrupp illustrates the success Microsoft has had in moving from its traditional licensing model to an emphasis on partnerships and subscription-based cloud-computing products and services. Bass said Thyssenkrupp has flagged 26 digitisation projects, and today every single one "has some touch point into the tech platforms of Microsoft." Thyssenkrupp has "gone from being a producer of things and a servicer of things to selling things as a service," said Sam George, Microsoft director of Azure IoT engineering. "They've gone through quite a transformation." George said he has accompanied Nadella on several customer visits. Microsoft has entered similar partnerships with companies including Kroger, Starbucks, Chevron and Adobe Systems. The company said 75 per cent of Fortune 500 companies have at least three Microsoft cloud enterprise services, up from 70 per cent having at least two in 2015. 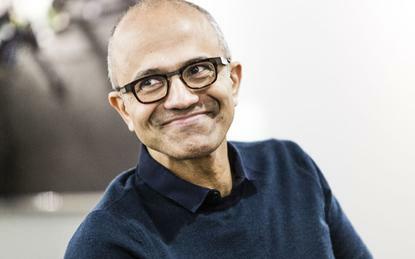 Since changing the way it reports revenue in late 2015 to emphasise cloud services, Microsoft has seen its Productivity and Business Processes segment, which includes Office 365, go from declining three per cent year-over-year in the first quarter of fiscal year 2016 to 28 per cent growth in the first quarter of 2018. Growth in the company's Intelligent Cloud, which includes Azure, has gone from eight per cent in the 2016 first quarter to 14 per cent in the same period this year. Bass said his company no longer uses private data centres and is on a path to eliminate on-premise computer servers. Already, 50 per cent of Thyssenkrupp North America’s compute and storage is deployed on Azure, and that is expected to grow to more than two thirds within the next 12 months. Among recent projects he’s proud of, Bass highlighted the use of HoloLens, Microsoft's augmented reality glasses and associated Azure software, in Thyssenkrupp's stair lift business. HoloLens lets Thyssenkrupp show customers what a stair chair could look like when installed at home, reducing delivery waits from 12 weeks to less than three weeks, Bass said.